On 7th April 2007, Brian Miller passed away at the age of 70. Today, had he still been with us, Brian, or Dusty as he was known to his former team mates, would have been celebrating his 80th birthday. I can recall that day in 2007 vividly. I was just getting ready to leave for our game at Birmingham, to be refereed by Mr Nigel Miller, when I received a text to tell me that Brian had died. It wasn’t a surprise. I knew how ill he was and that the day was inevitable but it was still a shock when the news came. At the time, he was the one player from our 1960 title winning team that I knew well, simply because I used to call in his sweet shop for my cigarettes in my smoking days. I got to know him really well and we must have spent hours and hours over the years talking football, in particular the one real passion we shared – Burnley Football Club. We used to have arguments about how the club was being run and how the team were going and I can remember one as if it were yesterday from around 1978 when he was coach. The one thing with Brian though, the next time you saw him the argument had been forgotten. One day the arguments ended when it clicked with us that we both wanted the same thing, a successful Burnley Football Club. It was just that we were coming from different directions. I was shocked and stunned. I didn’t think we had any supporters who didn’t know of him even though he’d been retired for a decade having left the club when he reached the age of 60. When one of them asked me if he’d played for us I told them he’d worked for the club in every decade from the 1950s to the 1990s, that he’d played in our championship team, in an FA Cup Final, had played for England, had captained Burnley, had coached at Burnley and managed us twice. Just for good measure I told them his son, son-in-law and two grandsons had also played for us. 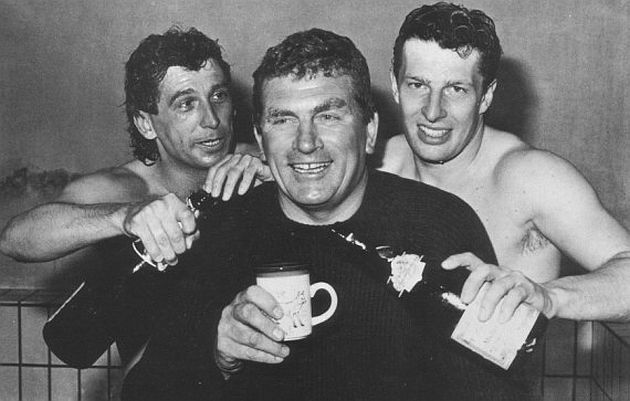 The day of his death was doubly sad because he was the first of that 1959/60 championship winning team to leave us. 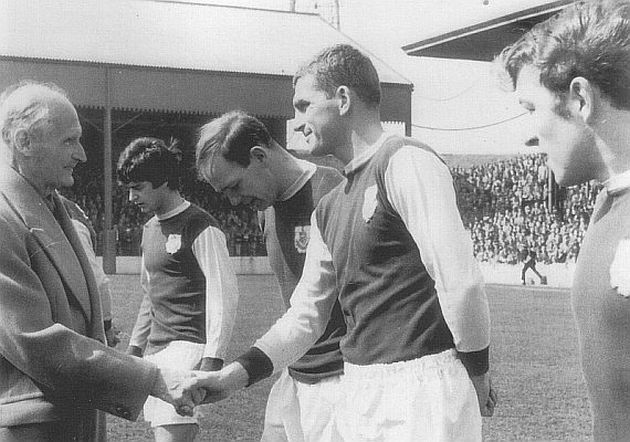 Gone was the man so many referred to as Mr Burnley, although Brian always told me that he wasn’t and that it was a bit embarrassing. But this was a man who witnessed the club at its highest and then at its lowest, from the left-half in the team that were champions of England to the manager of the team that almost lost its place in the Football League 27 years later. At the top, he played every game in that title winning season and went on to play 455 league and cup games for us before is career was brought to an end by a cruciate ligament injury sustained at Aston Villa just past his 30th birthday. Hapton born Brian was a Burnley fan before he was ever employed by the club where his first role was that of office boy. He came through the junior teams and finally made his debut in the marathon FA Cup tie against Chelsea in 1956, the second of the five games we played against the London club in the fourth round. It was only a brief stay in the first team of four games with just one of them at home. We beat Sheffield United 1-0 with him scoring the goal. Over the next three seasons he played a fair number of games but it was the retirement of Les Shannon that opened up the way for him to become a regular in that wonderful season for our club. From that point on, until the day of the injury, he was the regular left-half at Burnley. Like many Burnley players of the time, he didn’t really get the recognition he deserved. He played for the Football League and England Under-23s, but only one full England cap came his way, in a friendly against Austria in Vienna when he was played out of position at right-half. John Angus made his only England appearance in the same game, the right-back utilised at left-back. As the team changed, as the likes of Ray Pointer and Jimmy McIlroy left, he was one of the mainstays of the team and was again an ever present when we pushed hard for the league title in 1965/66. It was to be his last full season. The 1966/67 season saw his play in the Fairs Cup. He’d played in all our European Cup ties and played in all these games too, the only Burnley player to achieve that. When we went out 3-2 in a two legged tie against Eintracht Frankfurt he scored both goals. Just days after that defeat, he suffered an injury in a 1-0 win at Aston Villa. George Bray, then the first time trainer, was asked how he was when he came back for the second half. George was known for understating things but his: “It’s nothing serious, he’ll be alright next week,” was stretching that. Brian wasn’t fit for the Arsenal game a week later and the injury had brought his playing career to an end. 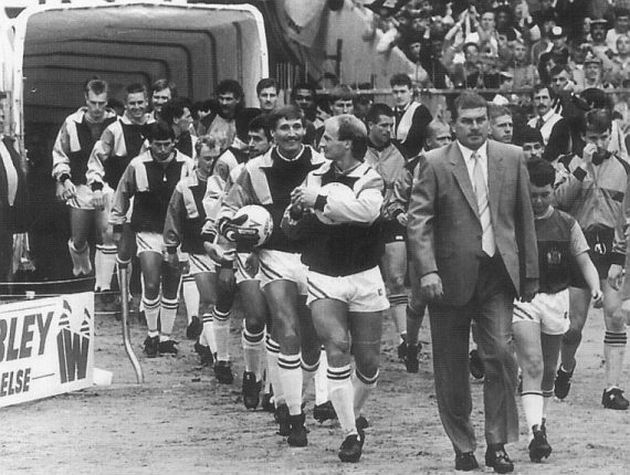 A year later his retirement as a player was confirmed and he joined the staff as reserve team trainer/coach and went on to replace Bray when he, another Turf Moor stalwart, retired. From 1968 until 1979 he was a coach at Burnley and then became Bob Lord’s last ever managerial appointment, taking over a team that was struggling at the bottom of the second division. We went down, but two years later he brought us back up as third division champions. He knew the squad needed strengthening. In the summer he had all of Glenn Cockerill (Lincoln), Danny Wilson (Chesterfield) and John Aldridge (Newport) lined up and soon after the season started he wanted to bring in Peter Reid, the Bolton midfielder. He wasn’t able to bring any of them in and, although we signed Willie Donachie and Brian Flynn, we struggled. It was a strange season when we beat almost everything before us in the cups but could hardly find a win in the league. On this day, 19th January 1983, some 34 years ago, I went to get the coach to go to Spurs for the League Cup quarter-final. “They’ve sacked Miller,” Peter Higgs, the Burnley Express Sports Editor, told me. Yes, we’d sacked him on his 46th birthday. On 1st January that year, in a rare win, this against Sheffield Wednesday, he brought on his son David for a debut as a substitute. The player coming off was his son-in-law Derek Scott. It was the only occasion David played for his dad. We did go down with Frank Casper in charge and over the next three seasons we had four more managers before the club turned to Brian again in the summer of 1986. He once said that he couldn’t believe how much the whole place had deteriorated in such a short space of time. It had, and no more so than on the pitch. Brian remained the calm figure as we went right until that last game against Orient before preserving our Football League status. One year later he led us out at Wembley. What a proud moment that must have been for someone for whom the club meant so much. It might have only been the Sherpa Van, but at least, with a collection of free and cheap transfers, he’d started the rebuilding process. He called it a day in January 1989 and became chief scout right through to 1997 when he finally hung up those boots. Did he walk away from Burnley Football Club? Not on your life. He remained as passionate as ever and I don’t think many home games were played without him sat in the stand watching and willing us to a much hoped for victory. He even had the delight of seeing his two grandsons, first Chris and then Paul, play in the first team. That day in 2007 really was one of the saddest days to be a Burnley supporter. He’d been in hospital for a while and I’m told he perked up on a Saturday afternoon when he could follow the Burnley games and this was at a time when we went on that horrible run of games without a win. Significantly, we ended that run with a 4-0 win against Plymouth with Brian, as keen as ever, enjoying his last Burnley game from his hospital bed just four days before he passed away. 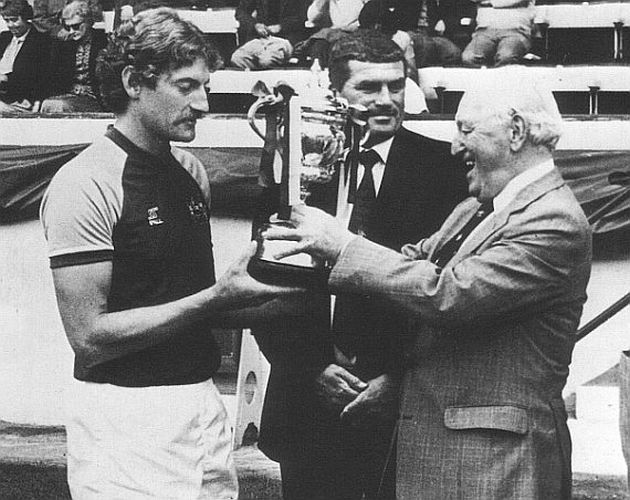 I wrote at the time of his death that Burnley Football Club had been richer for their association with Brian Miller and, with his passing, was so much poorer. One thing I do know with some certainty is that he would have been so pleased and so proud to see how well the club is doing now. Long after he’d left the shop and long after I’d given up smoking, when we met we would always have a good chat about Burnley and some of the people he’d been involved with at the club. I too feel richer for having known him so well for so long. If you ever hear anyone asking who Brian Miller was, please tell them. He was special and he fully deserved the title of Mr Burnley. There will never be another Brian Miller at Burnley Football Club.